Some of Porubcans products change seasonally or have limited time periods. This allows you to “mix it up” a little for a time. Holiday Breads, Cookies, Spreads, Quick breads, and Desserts are typically the ones that vary. Please order early to get on our list. Porubcans Bourbon Fruitcake is available all year long. 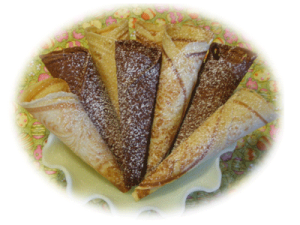 Delightful Chocolate and Vanilla Krumkake Cones to be filled decadently with whipped cream, fillings, puddings, and cheese fills. Topple with fruits such as chocolate dipped strawberries, chocolate curls, toffees, nuts, bananas with pecans and drizzled with honey. Then just sprinkle with confectioners sugar to devour. Or grab one up and fill it with your favorite ice-cream like black cherry with whipped cream. One of my favorites its to fill with whipped cream, alternating with ginger spice granola or almond Brickle.